KG, if you don't wanna join, then I'm with you man. All the way. 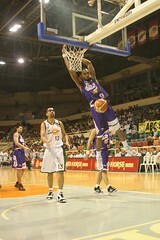 I’m talking of course, about KG Canaleta’s desire not to join this year’s Dunk Contest at the PBA’s All Star Games. KG is a free man. First of course is the obvious. KG is a free man. Even if there happens to be a prevailing contract between him and the PBA (I’m not sure there is one, but assuming there is), I assume it would at most be similar to an employee – employer contract, wherein one is compelled to do their duty whilst under employment. However, even the most stringent of contracts does not force people to do anything against their will. The worst it can do is exactly what they did – threaten to impose a fine against KG if he didn’t join. But even so, at the last moment it appeared KG couldn’t care less, meaning that it was ok by him – and even so I’ll assume such a fine is questionable at best. I mean, did he curse at a referee? Did he refuse to suit up for an official game? Did he get into a fight or intentionally hurt someone? Of course not. None of that happened and he was well within his rights. We all know already. By the time the Slam Dunk competition started, everyone who’s keeps up with the PBA knows that KG doesn’t really wanna join. So why the hell would I want to watch a competition where you know one of the competitors doesn’t wanna join? I want to watch competitions where you know each participant is fighting tooth and nail to win. I want to feel the drama, the excitement, the unpredictability of a fight where each fighter wants it HARD. In a competition where I know one of the participants is second thinking himself, how am I assured he’s even gonna try? Steve Nash. An example of a player not really wanting to join is Steve Nash in this year’s NBA All Stars 3 Point Shootout. Yes I know, this is gonna break a lot of fans hearts, but as I watched, the announcer mentioned that Nash was compelled to join under contract. The result? He didn’t even get past the 1st round, ending up with 9 points. And this coming from a career 43% 3 point shooter, ranking #11 in the NBA in 3 point shots made. Am I saying he intentionally flubbed it? Of course not (and besides how can you ever be sure?). But still, 43% career is 43% career. 9 points, in a shootout where you can score 30+, is pathetic for a guy like him. He didn’t feign an injury. KG could’ve taken the easy way out. In fact, I’m sure there must have been one or two people who could’ve suggested that he just pretend he was injured to get out of it. I mean how hard can it be? Players get injured all the time. He could say it happened in practice, while working out, even say he slipped on a bar of soap in the shower. He could’ve said ANYTHING. But instead, he just said ‘Bakit naman? Karapatan ko naman ‘yun na hindi sumali‘. Well said, friend. It’s just a dunk contest. There are people out there who watch basketball just to see dunks. These are not the people who really love basketball. They should, instead, buy one of those And1 Mix Tapes, or buy one of those ‘Ankle Breaker’ or ‘Top Best Dunks EVERRR!’ DBDs from your neighborhood DBD provider. Watching those, you don’t have to trouble yourself with things like ‘team play’ and ‘passion’ and ‘discipline’ and annoying things like that. All you have to do is sit back and watch some super athlete who couldn’t make it in the pro league dunk a ball and they’d be happy. Of course, the PBA is gonna say the ‘fans’ aren’t gonna be happy. Hell, they might even boo him off the court everytime they see him. As far as they’re concerned, they wanna see DUNKS! And KG is a GREAT DUNKER, so HE SHOULD DUNK! He has a DUTY TO ENTERTAIN PEOPLE! WE PAY HIM TO! Right?!? First, are these the real fans of basketball? Because if they are, they would recognize that basketball is a team game, and not of individuals, even if these can perform superhuman feats of athleticism. Placing so much weight and on a side show at that is pandering to those entertained by momentary feats of flashiness, as opposed to those who truly care for the game. But finally, yes KG is a great dunker, but he is also his own man, capable of making his own decisions. If he doesn’t wanna join, then by God, he shouldn’t join. That’s what living in freedom is all about. I know it may sound silly, but believe it or not, it’s as simple as this: KG can do anything the HECK he wants to do. Being forced to do something against your will belongs in places like China or North Korea. KG has decided weeks before that he wouldn’t compete. Two reasons: he hasn’t prepared for the competition because he has an injury (that would simply curtail his aerial maneuverings); second, with 3 dunk titles under his belt, he is already considered a legend in this event, why would he risk his title getting upended by an upstart. I expect a battle royale next season though. KG vs. K-Will and JC Intal. Intal is the only man I know who beat KG in a slam dunk tilt. KG ought to do what he ought to do. And there should be more rookies joining the contest. “just a dunk contest”? it was never “just” dunk contest, if it is, why the heck are we talking about it? thank you for posting this column, i appreciate. KG has the right if he doesn’t want to join the said event even without excuses!!! Previous Previous post: Alaska Commercial: Cisco Oliver or Billy Robinson? Next Next post: Kenny Smith's Hyperdunks!